After weeks of buzz surrounding what’s become an unpopular plan to paint over public art with new public art, the city of San Luis Obispo is going back the drawing board. Started as a pilot program in 2010, the city pays local artists to spruce up metal utility boxes through the downtown core. The project is designed to deter graffiti and add artistic color to otherwise gray and green metal utility boxes. And it’s worked. The SLO Box Art program became immensely popular and put a spotlight on the city as several other cities replicated the program. 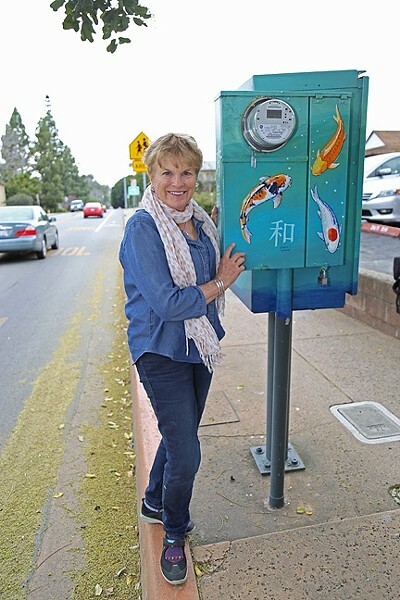 BELOVED KOI: Marcie Hawthorne stands next to a utility box she painted in 2010 as part of San Luis Obispo’s Box Art program. The city had plans to repaint several of the boxes, including this one, but changed course and will consider leaving some as they are. The project garnered widespread support—except for a controversy over one particular box, at the intersection of Pismo and Broad Street, which became the center of ire for a few neighbors who were disturbed by what they considered to be a drug-induced motif. The city put a call out earlier this month for submissions for the new art, due by March 18. That announcement sparked the local art world to take to social media. Several community members who have grown attached to the art were bothered that the city would paint over existing art, much of which is still in good condition, and said the city should instead expand the program to other neighborhoods that have expressed a desire for the program. Hawthorne, a local artist and muralist, has painted three boxes, including the koi on Chorro Street near Palm Street, “Message in a Bottle” on Chorro between Monterey and Higuera that depicts trout, and one on Higuera and South streets that depicts wetlands birds. “It seems silly to paint over that one,” she said. Her third painting has a few scratches that could be touched up. She agrees with the social media chatter that’s coalesced into a somewhat united message—expand the project first, and only mess with existing art as needed. “The more art that is around, the more value it is and the more visible it is to the community,” she said. That sentiment was echoed by Downtown Association Executive Director Dominic Tartaglia at the Feb. 16 City Council meeting. The City Council decided to re-evaluate the plans and consider leaving some boxes as they are, repairing those that need it, and expanding the project to other neighborhoods. For that, Hawthorne commended the City Council and staff for responding to concerns. Mudgett said that the City Council is expected to hear this item in April.